Alexandre Dumas's The Man in the Iron Mask penned Louis XIV's brother as identical, and a man who was later locked away with his face obscured so he could never pose a threat to the king. In reality there was no way Philippe, Duc d'Orleans, was a threat to Versailles. Philippe loved putting on dazzling displays of fancy wigs, rings, flashy clothing and, yes, high heels. He sashayed through the halls of Versailles blowing kisses to boys and indulging in all manner of more feminine activities. A court reporter cited as claiming him "short and pot bellied" and the sort of man who would cover himself in ribbons and women's perfumes. Louis XIV adamantly disliked such behavior on men, but tolerated it from his brother, who he adored. Philippe was encouraged to engage in his frilly ways in order to leave the more masculine ways to his older brother. When court business would arise, Louis would tell Philippe to go amuse himself so he could settle down to the work of running a kingdom. Off the duc would go to his favorite pastimes. Philippe enjoyed gambling, chasing young men, and court life. He was an art collector and patron of architecture and despite what his debts and dalliances might have cost Louis, the brothers spent much time together. He was married twice. 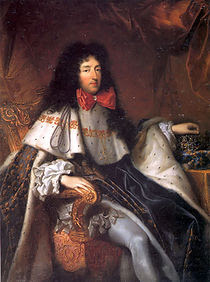 His second wife, Elizabeth Charlotte, a princess of the German House of Wittlesbach, bore him his only surviving son--Philippe Charles d'Orléans, petit-fils de France, Duke of Orléans. Despite the women's clothing, make-up and jewels, Philippe Duc d'Orleans proved himself a fierce warrior in battle and fought without fear. His wife remarked he was more afraid of gunpowder smoke than actual bullets. Perhaps the smoke did more damage to his flamboyant wigs.